Jim: "You're in better shape than I am, you know." Sue: "Then how come you're going faster up this mountain than I am?" This was one of my most fun days on the Trail so far, mostly because I got to share part of it with Jim. So many times this summer I've wished he were with me when I'm in a particularly beautiful or interesting place on the Trail. One reason I take so many photos each day is for him to see what I've seen. Of course, it's never the same as being there. Photos just don't show scale and heights and depth of field - like the waterfall in the photo above left. 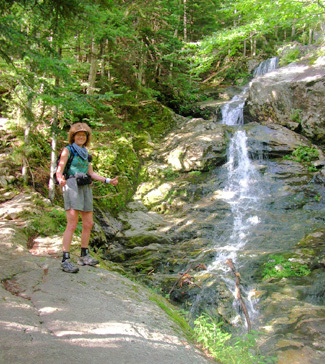 The AT follows the Beaver Brook Cascades for about half a mile on the northern side of Mt. Moosilauke at a very steep pitch. The series of falls is delightful to see and hear. A photo can't capture that, so I was glad Jim was there to see and hear for himself today. Same thing with the Trail itself. There is no way I could have adequately described how hard it was to Jim - or to the people reading this journal. Horton described it as the "toughest descent yet" as he proceeded south to north during his speed record in 1991. Of course, he was doing mega-mileage with other tough mountains the same day, but this nine-mile stretch was quite enough for me on an "easy" day. I decided to go north-to-south ("backwards") to avoid coming down this part of the Trail. 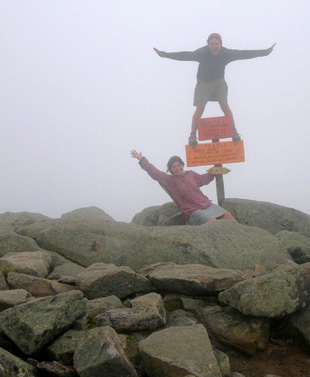 The AT guide and hikers' journals indicated it was a knee-killer, with a 2,600-foot drop in about two miles from Mt. Blue, which is adjacent to Mt. 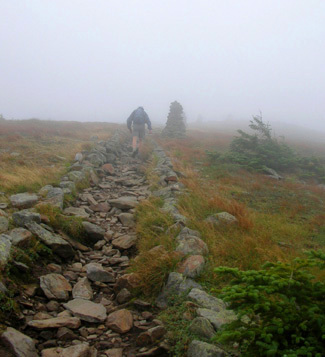 Moosilauke (a total of 2,900 feet in 3.8 miles from the summit of Moosilauke). I made the right choice to go up instead of down this side. The south side was hard enough on me going down; the north side would have put me over the edge, at least figuratively. Jim went out and back, so he got to experience the treacherous descent. He won't soon forget it! You wouldn't want to do this section on a rainy day. It was treacherous even today. I thought the rocks would be exposed but they weren't. Most of the trail on the mountain is under trees. So even though it was a sunny day, some of the rocks and roots were wet anyway. It rains a lot on Moosilauke. There are numerous creeks and wet areas along the Trail. I did fine going up, although it took us nearly three hours to go 3.8 miles to the summit. 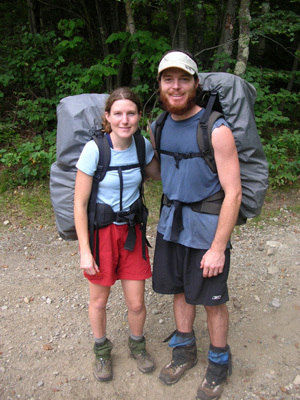 Part of that time we talked to descending hikers and I took about twenty photos. But mostly it was because of the steep pitch and difficult footing. This is the first time I've seen rebar hand-holds along the side of a trail to help facilitate climbing or descending. I've seen it used as a foot-hold (like on Dragon's Tooth in Virginia). I read there were ladders to negotiate the rocks but we saw no ladders here. There were some precarious wooden steps that were somehow attached to the smooth rock slabs; we couldn't see bolts, however. How did they do that?? I would have had great difficulty on those little wedges if I'd come down that way. I didn't take either of my trekking poles today, and I missed them. Recently I've been using two to help me with pulling myself uphill, taking the stress off my knees downhill, and balancing through creeks and over rocks and logs in other wet areas. I thought with the tough ascent I'd need both hands to climb and the poles would be a bother. But I really missed them, both up and down. Jim and I both love running and hiking in the mountains out West, particularly in Montana, Wyoming, and Colorado. Out there, you often don't get above tree line until about 10,000 or 11,000 feet. That "alpine zone" is fascinating to both of us. We love the plants, the marshy wetness, and the unobstructed views. Today we found out we don't have to drive 2,000 miles to get that same experience. And we weren't in oxygen deprivation, either! You see, in New Hampshire you reach that alpine zone somewhere over 4,200 feet, depending on how far north you are in the state. On Moosilauke we hit (quite abruptly, in fact) the alpine treeless zone at about 4,600 feet, pretty close to the 4,802-foot summit. At least it didn't rain. Jim estimates the wind was about 30 MPH. It was in the 60s F. in the valley and probably in the 40s at the summit. We had on our Marmot Precip jackets but didn't bother with the hats, gloves, or pants we had in our packs. When we both got numb fingers we decided to go our respective ways down the mountain. It wasn't a good day for lunch on Moosilauke! But the clouds didn't dampen the spirits of anyone at the summit. There was literally a crowd of hikers up there. We met "Tink" just as she was leaving the summit and heading north. Sitting inside the stone foundation of a former summit inn/hostel (it burned and wasn't replaced) were about fifteen teen-aged girls. The rocks reminded us of the little alcove at the top of Mt. Elbert, Colorado's highest peak. Before long "Gypsy Lulu," "Touk," "Mouth" (in his kilt), and "Linux" arrived. Jim took a photo of Touk on top of the summit sign, with Lulu below. What a pair! I think they're practicing for their Katahdin photo in a few weeks. 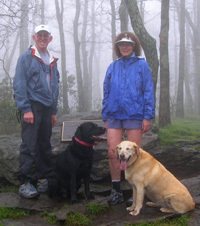 "Captain Bacardi" and his hiking companion were right behind them; Bacardi is a section hiker who does a two-week section of the AT each year. 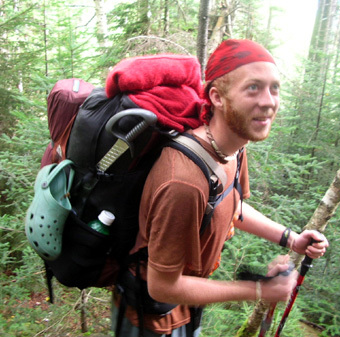 He's completed all the miles from Georgia to here, and will stop in Gorham this weekend. He'll finish in a couple years. 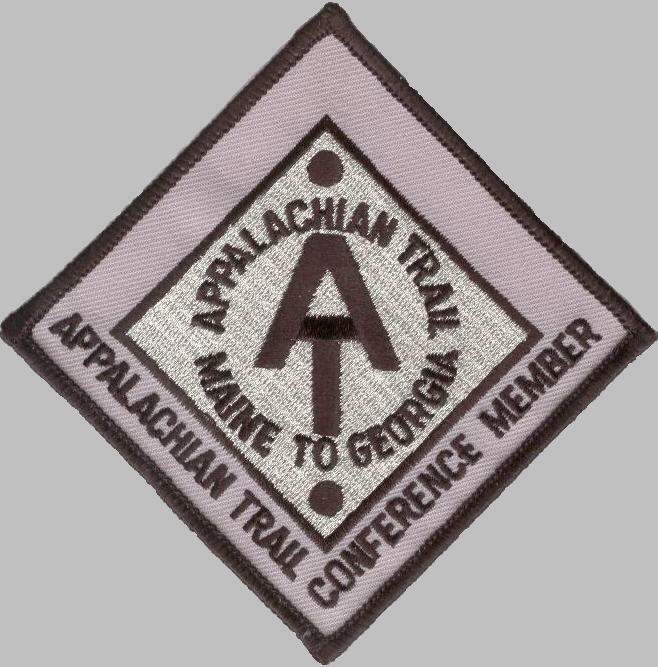 We also met several NOBO thru-hikers on the way up the mountain; they were going down the really tough part: "Brother Buzz," a fellow our age from Cape Cod; "Hareball," a middle-aged female (born under the sign of the hare); and "Lightning," "Navigator," Thrifty," "EM" ("Epistemological Megalomaniac"), all young men. This is "Thrifty," who I first met back in Virginia. Jim noticed he was carrying a fly swatter on the outside of his pack. He also showed us a plastic saber, seen below. He's a fella with a sense of humor, which is a real handy thing to have out here. Several of the hikers had spent the night at the Beaver Brook shelter a bit up the Trail. It rained there yesterday afternoon and they were rewarded with a beautiful double rainbow - one of the many memories they will cherish from the AT. On my way down the south side after Jim and I parted, four other thru-hikers passed me near the top; I didn't get their names. Farther down, a group of eight or nine college students with backpacks were headed up the mountain on a five-day hike. 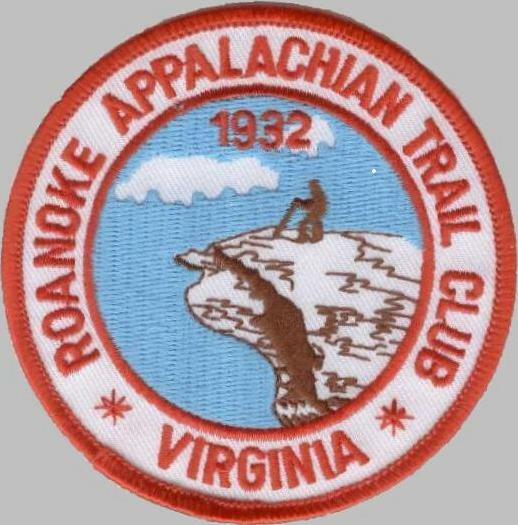 Closer to the bottom I met red-bearded "Kokomo," a NOBO thru-hiker about my age. Jim also saw several SOBO hikers when he went back down to the truck. Popular place on a Tuesday! When they mentioned they were going to the Glencliff post office to get their box of warm clothes, etc., Jim drove up. They accepted our offer of a ride to town. Jim has given hikers rides several times along the Trail. The descent on the south side was longer (3,700 feet) but spread over five miles from the summit. The first mile of drop was fairly steep and tedious on slick rocks, roots, and mud, but not nearly as bad as the northern side would have been to go down. I'm so glad I went SOBO today. I was able to run a little on the Moosilauke ridge before descending (where the AT follows an old carriage road), and off and on the last three miles. I'm also glad I cut this section 'way short. I was scheduled to do over 25 miles today but after I saw how long 23 miles took yesterday, I knew I couldn't do Moosilauke AND the Kinsmans in one day -- especially not with my sore toe. My little toe felt better this morning but it was still very painful to put on a shoe (either Hardrock or Vitesse). I was in tears, even wondering if I should try to run and hike today. I don't know what's wrong with it (bursitis? infected?) and don't want to make it worse. Jim came up with a workable solution - cutting a slit in the side of my shoe. Well, duh! I've done that before but not for a lot of years, so hadn't even thought of it. That worked pretty well, although running and going downhill still caused some pain. The worst was the searing pain when I'd accidentally hit it against a rock or root. My word, that sent a jolt up my entire leg. Tonight I've been icing it and soaking it in Epsom salts. Jim just cut a slit in another pair of shoes for tomorrow . . .
Next up: the north and south peak of Kinsman, which I've read is the toughest mountain on the entire Trail. Nobody said this would be easy. Welcome to the Whites, Sue.